Ancient roads (that do not preserve their original paving) will be used for the visitors’ tour, which will enhance their experience, as well as metal runways and metal platforms, by which to reach the most important buildings and the exhibition of movable finds. “In the summer of 2019, a decade since the Acropolis Museum began operating, the excavation should at least ‘open’ to the public as an archaeological site”. This estimation/wish was made by the Director of the Acropolis Museum, Dimitris Pandermalis during a presentation to the Central Archaeological Council of a study for the enhancement and configuration of the said excavation as an archaeological site open to the public. It received not only the “go ahead”, but also credit from the members of the CAC. “At last the issue has come to the CAC. It is so important for us to be able to make the site ready to be visited, which will give added value to the museum itself that is of such significance for our country, while the possibility of visiting the excavation will draw even more visitors”, said the head of CAC, secretary general of the Ministry of Culture and Sports Maria Andreadaki-Vlazaki. “With the construction of the Acropolis Museum, the excavation on the Makriyannis plot of land became inevitably an inseparable part of the museum itself and we are essentially going ahead with implementing this thought, which is a paradox, that we consider the excavation a huge exhibit of the museum”, said Mr Pandermalis among other things, stressing that with this implementation “the visitor will immediately become familiar with the museum’s double character, since it has antiquities in situ and antiquities that have been transferred there. 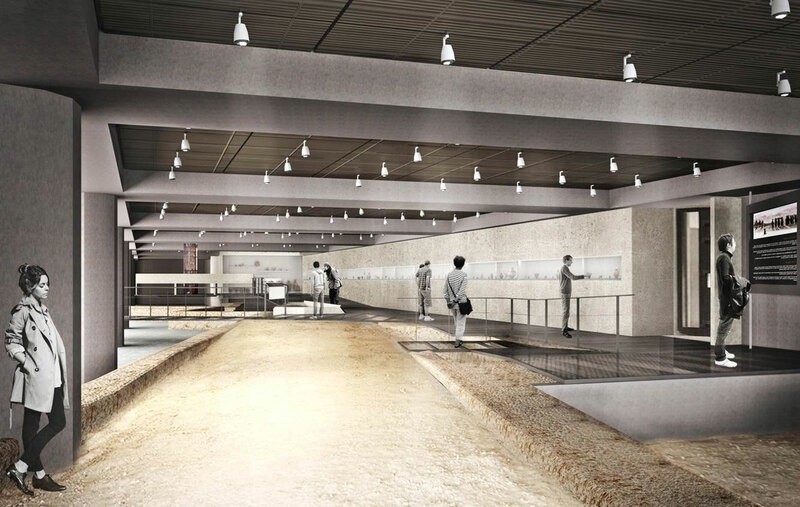 It becomes a museum both of the Acropolis and the excavation”. Regarding the study, ancient roads (that do not preserve their original paving) will be used for the visitors’ tour, which will enhance their experience, as well as metal runways and metal platforms, by which to reach the most important buildings and the exhibition of movable finds. More specifically, two metal passages/bridges are being made inside the excavation with a perforated metal grid floor to have an uninterrupted view of the archaeological site below, as well as platforms with a similar floor at two points. Included in the visitors’ route is the exhibition of movable finds at the south end of the excavation, in an area protected by the museum building. Appropriate lighting, information boards and digital applications promise to enhance the experience of visitors, who will have the opportunity to better understand the palimpsest of the neighborhood and encounter a more realistic picture of antiquity, “which not only consists of great moments , as when they decided to build the Acropolis, but also of modest ones,” as Mr. Pantermalis said. Access for disabled people will be provided for, while admission to the excavation will probably be free, which will be counterbalanced by a small increase in the museum ticket. While excavating the Makriyannis plot of land, part of the ancient city’s residential network came to light in successive construction phases. From 2000 up to 700 BC, the region is used as a place of habitation, that becomes restricted during Archaic times. Systematic habitation and urban planning of the region begin in the last decades of the 5th c. BC. The settlement was organized on either side of two uphill roads converging towards the sanctuary of Dionysus. A third road led west to the agora. The building islets were organized in stepped terraces, formed between the gates and secondary streets, while the houses of Classical and Hellenistic times were organized around inner courtyards. The houses were destroyed in the 1st century BC probably by Sulla’s troops. Various workshops were installed in their ruins that were in use until the first half of the 2nd century AD, when the area was reorganized and houses were built with courtyards and colonnades, while richer residents owned a private bathhouse. The district was destroyed in 267 A.D. The region was once more reorganized at the end of the 4th to the beginning of the 5th century. Among the simple houses, luxury homes are also built. The area was destroyed again around the end of the 5th century, while new buildings see the light in the centuries to come. From the 10th century on, the workshops were abandoned and the buildings gradually collapsed. As of the 13th century, the area was finally abandoned until the late 19th century, when the military hospital, known as the Weiler Building, was constructed.